At the 11th hour here, I’m highlighting a handful of Senate candidates who I think are really outstanding potential congresspeople who I think deserve your support (your vote, and your help spreading the word and getting others to vote). 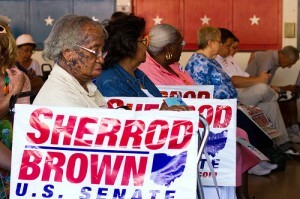 Sherrod has long recognized that a smart energy policy is also smart jobs policy and that Ohio is leading the nation. According to a report released by the Council of State Governments, Ohio led the country in the number of clean energy jobs created by the Recovery Act during the first reporting period. Sherrod is a leading voice in Congress for policies [that] help manufacturers retool and expand their operations into clean energy production. He has consistently fought for tax credits to help Ohio’s manufacturers, which have created hundreds of jobs in Ohio, more than almost any other state. Sherrod also introduced legislation that would create a revolving loan fund to help auto suppliers and other small and mid-sized manufacturers improve their long-term competitiveness and retool for the clean energy economy. This legislation, known as the IMPACT Act, has been endorsed by the National Association of Manufacturers as well as thousands of small and medium businesses who recognize the opportunities of a clean energy economy. An estimated 52,000 jobs could be created in Ohio under Brown’s bill. How could you not like all that! 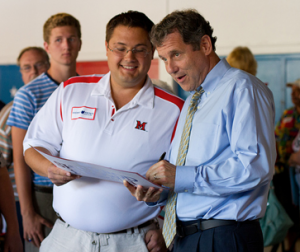 “Sherrod has led a fight to revitalize American manufacturing with a four-point plan, and manufacturing is on the upswing,” Mr Brown’s campaign page notes. For a full look at those four points, head on over to his Ohio Jobs page. There’s more, but let’s move on to another topic, fiscal responsibility. Yep, that’s what put us in the sinking boat we were in 4 years ago. The fact that some members of society would go right back to that is astonishing. Luckily, Mr. Brown isn’t one of those people. Just as it took eight years to get in this fiscal hole, so will it take several years to dig out. In the near term, Sherrod supports a five-year freeze on spending subject to the annual appropriations process, which will save $400 billion. He also supports health care reform, which will save $143 billion in the first decade, and another $ 1 trillion in the next according to the Congressional Budget Office. And he supports returning the tax rates on the wealthiest Americans to where they were during the Clinton Administration, when our country created 23 million jobs. Just as important as what Sherrod supports is what he does not support. Many politicians in Washington, DC have proposed that Social Security should be discussed as part of the solution to the deficit problem. Sherrod is adamantly opposed to any such proposals. Social Security is self-financed by payroll taxes — it does not add a penny to the federal budget deficit, and should not be cut. Sherrod thinks savings have to begin at home, and supports legislation to eliminate the automatic cost-of-living increases for members of Congress. And he supports the Pay-As-You-Go (PAYGO) rules that helped produce balanced budgets in the late 1990′s. For more, check out the link above (there is much more goodness there). 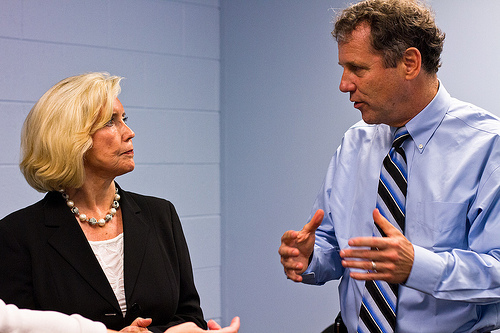 Mr Brown also has a strong record on supporting seniors, health care, and agriculture. All in all, Brown is a solid Senate candidate with a great record. He’s worth your vote. But more than that, he’s worth the extra support you could give by sharing this information with friends, family, or neighbors. Note: no, I have no affiliation to Mr Brown and this post is simply a labor of love in support of one of the few politicians I greatly support. Images via website of Sherrod Brown.